Located on the avenue Montaigne (the heart of fashionland), this exclusive brasserie designed by Jacques Garcia serves good New French cuisine. Entirely renovated in 2010, this New French the Grand Palais offers a grandiose terrace where a hip crowd congregates for a meal under the columns. Cuisine under the control of Eric Frechon, Chef at the Bristol Hotel. This restaurant serves excellent French contemporary fare as well as international dishes. Well-prepared French dishes include steak tartare, frog's legs with garlic and parsley and calf's liver flavoured with pomegranate juice. Tucked inside the Palais de Tokyo its terrace has splendid views of the Eiffel tower. Dailly, continuous from 12pm to 2am. A penthouse restaurant with a spectacular view (located on the top of The théâtre des Champs Elysées). The cuisine is supervised by the Pourcel brothers, the twin Chefs of the three-star Michelin Jardin des Sens in Montpellier. On the sixth floor of the Georges Pompidou Centre (Modern Art Museum), the restaurant Georges offers one of the most beautiful panoramic views of Paris. The Parisian and international trendy guests appreciate both the classic menu supervised by the Costes brothers, and the weird modern architecture of the place, a Dominique Jacob and Bredan Mc Farlane creation. The very peculiar decoration of this former train station (out of old railway signals) doesn't make the quality of its rotisserie and French traditional cuisine lesser. Beautiful terrasse along the ancient railway path. Enormous fashionable restaurant located at the heart of the Latin Quarter. Original decoration with a mezzanine around the central atrium. Innovative French cuisine. Right in the heart of St Germain des Prés, one of the best locations in Paris. This restaurant owned by the Costes brothers is the place to be. Decoration inspired from the 30th, by the designer Christian Liaigre. French New Yorker Jean-Georges Vongerichten's first venture in Paris, located right near the Rond-Point des Champs Elysées. Christian Liaigre has cast his spell over the dining room that is a popular meeting place for the Paris jet set from show business and the world fashion. There is served a subtle and inventive cuisine of many flavors. 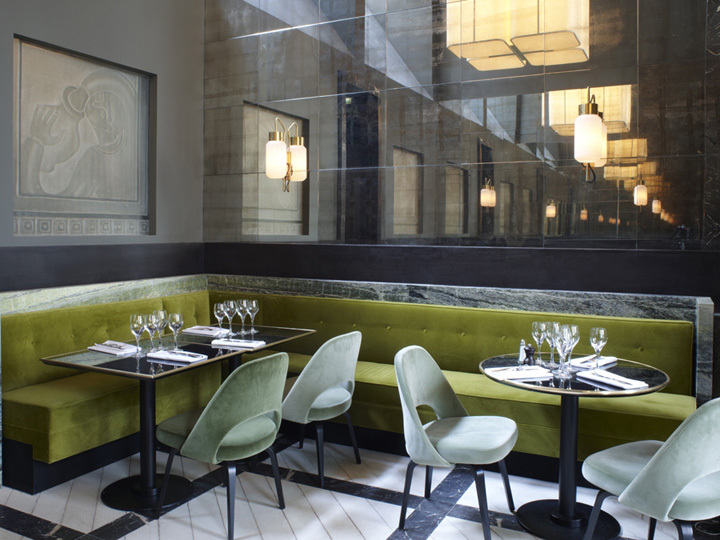 Located near the new Ralph Lauren boutique of the Bd St Germain, this chic and classy restaurant serves American cuisine (Burgers, Caesar salad...). Exceptional terrace on summer, in the heart of Paris. Trendy Place for this restaurant and club owned by the Costes brothers with a warm and cozy atmosphere made by Jacques Garcia. Shaperd selection of music with pop-rock electro on Fridays and house on Saturdays.